"Hey...if we're all the same size, why is Phen so small?" 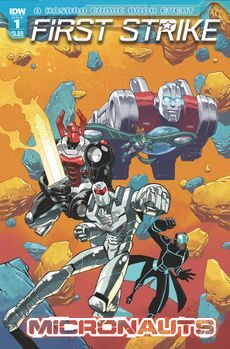 While Cybertron descends into chaos, the Micronauts find themselves targeted by a Dire Wraith plot; and their only hope is to seek out the aid of Rom, the Space Knight! With Oz gone, the Micronauts feel the gap he left as they mill about a yard. Though Microtron and Biotron have their work to distract themselves with, Phen observes the downtrodden Larissa and Acroyear's warrior stoicism. Annoyed at the latter, Phen, storm offs before Acroyear admits he does miss Oz but takes comfort that Oz is doing good for Microspace and that the rest of them are still together. The tender moment is interrupted however when they come under attack...by a lawnmower. Unable to outrun the machine, Larissa uses her forcefield to stall it and the Micronauts decide to hightail it. As they board their ship, one of the men is bitten by a mosquito and suddenly sprouts tentacles and extra eyes much to his friend's shock. Biotron recognizes the bio-matter as that of the Dire Wraiths. When the insects home in on the Micronauts, they take to the skies to attack, the organics using ranged attacks while the mechanicals fight hand-to-hand. Despite their best efforts however, an insect spreads bio-matter on Phen. Though Biotron offers to decontaminate her, the two soon realize she is still herself, the insects' bioweapon being tuned to human DNA making the fight even easier for the Micronauts. A cold comfort however in the face of the infected human turning to ash in front of them as are the bugs. Biotron grabs one for analysis and finds it began life as an ordinary insect but has been altered via a form of energy so unstable, the organic hosts simply could not contain it. A form of energy called magic. Acroyear scoffs at the instability before Larissa makes him see that the Wraiths will doubtlessly stabilize the bio-weapon and the extreme implausibility that the insects just happened to stumble upon the Micronauts. Biotron and Phen concur, with the humans and Cybertronians occupied on Cybertron, the Wraiths have full run over Earth and seek to rid themselves of whomever might still oppose them. Convinced, Acroyear sets course for the Wraiths' hideout to stop their horror once and for all. Tracking the Wraiths to a sewer system, the Micronauts briefly go over what they know of the Dire Wraiths and Rom before Larissa orders a message to be sent out to a Microspacian colony should they not return from this mission. Within, D'rge and another Wraith Sorcerer are discussing the virus and its effects before they take note of the Micronauts and set their Wraith Soldiers on them. Acroyear finds the Wraiths hard to kill before Biotron reveals that the Wraiths have repositioned their internal organs leaving Acroyear with no choice but to enter the Wraith's body and destroy all the organs. Microtron simply scans the soldier's anatomy for weak points and unleashes a barrage. The one Larissa and Phen are fighting however turns out to have once been human. Larissa offers her apology to the once-human as she uses her forcefields to destroy their head before the group charges on the Wraith Sorcerers. The Sorcerers are unconcerned however and call upon their magic, disorientating the Micronauts in one fell swoop and forcing them to retreat. Though the acolyte wishes to pursue, D'rge overrules him confident that their enemies will tear themselves apart. As the Micronauts lick their wounds, Acroyear comments on the power of Wraith magic and that the Micronauts must be ready to face it next time. Larissa however does not believe they can learn enough about it in time to stop the Wraiths' plan and asks Biotron if they have a means on contacting Rom. Biotron is one step ahead of her, having retained a copy of Rom's energy signature since Monument Valley and uses the geographical data gleamed from the Wraiths, who were themselves keeping an eye on their foe, to pinpoint his location. As the Knight is conveniently nearby, the Micronauts fly off to meet with him. "Biotron informed me Earthers share the grief of loss by presenting each other with flora. I confess I find the custom puzzling, but as we are here. Is it...helping?" "Yes, Acroyear. It is. Now put that down. I don't think I could carry it." -Acroyear offers Phen a flower. "That is indeed welcome news...most convenient indeed. And why wouldn't it be... since it's a trap. My Analyzer reveals your true nature, Wraiths! Your deception has failed... and so you must DIE!" -Rom proving he should have gone to acting college before he opens fire on the Micronauts. This issue and its follow-up are tie-ins to the First Strike event, but much like the G.I. Joe/M.A.S.K. two-parter, it doesn't have much to do with the main plot other than taking place at the same time: with the G.I. Joe leadership and the Transformers on Cybertron dealing with Baron Ironblood's attack, the Wraiths are free to carry out their own plots without fear of them interfering. From the Micronauts' side of things, this issue takes place after Wrath of Karza #5 with Oz having ascended to become a Time Traveler. Rom's side of things is a bit murkier as he's seemingly alone and back in North America. It's likely we're seeing him after ROM #14, which hadn't been released at the time of this issue's publication (ROM #13 came out on the same day) due to IDW's ongoing series of delays. Phen mentions that Larissa is Baron Karza's daughter, something established in the 2017 Micronauts annual and revealed to the team in Wrath of Karza #4. Both Rom and the Micronauts mention their team up in Revolution where Rom's translator deciphered the Old Cybertronian which they speak. Biotron mentions that the people (and heroes) of Earth dislike Rom due to the Space Knight directive of destroying a planet they deem too infested with Wraiths, something that first brought Rom into conflict with humanity in ROM #7 via the G.I. Joe members Beachhead and Grunt. Larissa instructs Biotron to send a message to a Microspace colony in the event they fall to the Wraiths. The colonies were established in Wrath of Karza #5 in a unification between Optimus Prime and the ascended Oz. Biotron references the caste system which Dire Wraith society is organized by. The Micronauts' new ship seems to be based on the Astro Station vehicle from the original toyline. Biotron says that Karza allied himself with the Wraiths in Revolution, but it was Miles Mayhem that Karza was dealing with; though Mayhem also had a deal going with the Dire Wraiths, Karza didn't, and simply enslaved them via enerchanging with them during the final battle. Dire Wraiths are revealed to possess the ability to reorganize their vital organs to better protect themselves. Science is blasphemy to Dire Wraiths. Regular cover: Either a tiny Rom and the regular-sized Micronauts or regular-sized Rom and the giant Micronauts, by Nelson Daniel. Subscription cover A: Larissa, Phen, Microtron and Acroyear fight tiny Dire Wraiths, by Chris Panda. Subscription cover B: Acroyear fights a Wraith Sorcerer, by Nick Bradshaw. This page was last edited on 8 May 2018, at 00:31.